Nuxt.js is an exciting opinionated structured framework for rapidly developing Web Applications in a single unified solution pre-configured with Vue’s high-quality components that abstracts away the complex build systems of Webpack powered JS Apps. If you’ve been intimidated with amount of complexity and knowledge required to develop an App using one of the major JS frameworks, we highly recommend evaluating Nuxt.js. Nuxt is an opinionated framework that integrates the most popular Vue components together in a pre-configured solution. It’s like developing within guard rails where it lets you develop entire websites using just Vue Single File Components placed in a conventional file and directory structure where Nuxt will take care of managing the routing and abstracts away the build configuration to generate optimal production builds where it employs advanced packaging techniques like automatic code splitting, link prefetching, SPA navigation of statically-generated cacheable assets and integrated support for ES6/7 transpilation, linting and js/css bundling and minification. Its watched builds enables Hot Module Replacement to enable the optimal development experience where it you will be able to see changes in real-time without needing to manually build or refresh pages. The Nuxt templates are also configured to support .NET Core’s watched builds which automatically detects changes to your .NET Core App and re-compiles and restarts them with the new changes. This lets us use Nuxt’s Web Dev Server during development to take advantage of its incremental compilation, Live Reloading and instant UI updates. 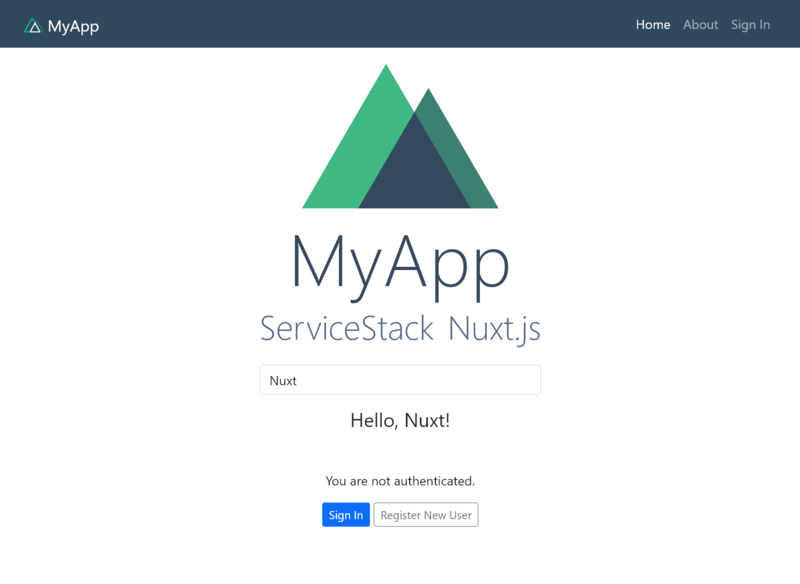 Then open http://localhost:3000 in your browser to view your App served directly from Nuxt’s dev server which will proxy all Server requests to ServiceStack Server running on http://localhost:5000. Any changes you make to your front-end will be automatically re-compiled and reloaded by the watched Nuxt build whilst any changes to your Server app will be automatically be rebuilt and restarted by the watched dotnet process. This will update the Servers dtos.ts and generate its corresponding dtos.js which can be natively imported as seen in gateway.js. Despite the App not being built with TypeScript, developing using a “TypeScript-aware” IDE like VS Code will still be able to utilize the generated dtos.ts to provide a rich intelli-sense experience. This publishes your App to bin/Release/netcoreapp2.0/publish that can then be deployed like any normal .NET Core App. One of the advantages of using Nuxt is that it generates a front-end UI with static .html files for all pages. This allows the static content of your Web App to be cleanly decoupled from your back-end your Server App and hosted independently on a CDN. Netlify makes this effortless where you can Sign In with your GitHub account and get it to create a new Site from a GitHub repository where you can tell it to host the static content in your .NET Core Apps /wwwroot folder on its CDN. It also synchronizes updates with every check-in so it automatically updates whenever you check-in a new version of your .NET Core project. Netlify has built first-class support for hosting Single Page Apps like Nuxt where it lets you check-in a simple _redirects file with all routes you want to be served by your .NET Core App and it will transparently proxy any API requests to your back-end server without needing to enable CORS. So the same .NET Core App that runs locally will be able to run without code changes when deployed despite having all its bandwidth intensive content served directly from Netlify’s CDN. This opens up a nice scalability option for your App Servers, maximizing their efficiency as .NET Core Apps just ends up serving dynamic JSON API requests.